Good evening. I am very pleased and honoured to join you all here tonight at this second edition of HeForShe campaign in celebration of the International Women's Day. As the theme "HeForShe" goes, I am standing right here to advocate the idea to speak up for women; to engage and to get the support of men to achieve equality. As a matter of fact, I am standing in on this very occasion for Mrs Carrie Lam, the Chief Executive, who is away in Beijing on duty. So to all intents and purposes, it is a living manifestation of "HeForShe". 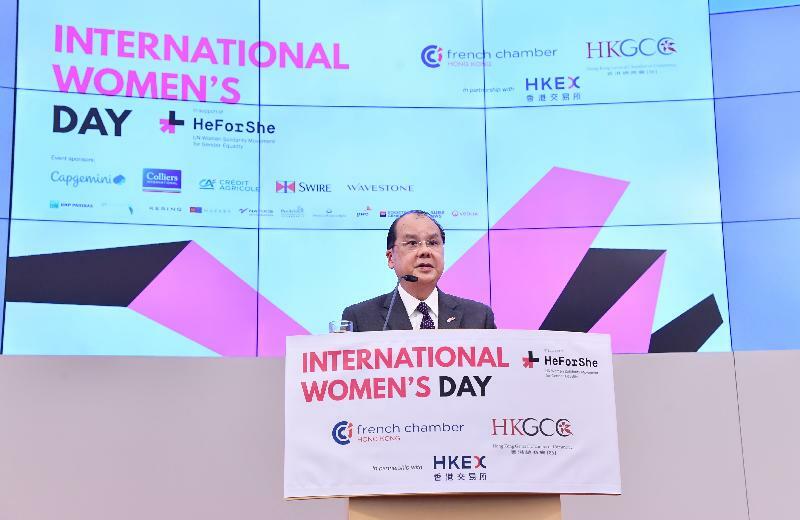 Gender equality is vital to Hong Kong's continued success as the premier business hub in the Asia-Pacific region and I need not impress upon you the significance and benefits of a gender inclusive and family-friendly working environment to developing, attracting and retaining the best of talents, both males and females. I would add that gender equality also means taking into consideration the interests, needs and priorities of both sexes while, at the same time, recognising their diversity. As such, gender equality is not and should never only be a women's issue, but should concern and engage both genders. I fully support the United Nations Women's HeForShe campaign which is a very timely one and I can assure you that our commitment in promoting women's development and advancement in all fields will only strengthen in the years to come. Challenges faced by women's development evolve over time. Women today often find themselves multi-tasking, juggling different roles at the same time, and balancing family and work life all the time. It is true that while some women choose to "lean in" - which many have achieved incredible success in every field - we will recognise that some may face barriers to genuine equal opportunity as roles and responsibilities in family sometimes make it difficult for them to fully realise their potentials. To this end, the Government accords high priority to creating a more enabling environment for women to make an informed choice if they would like to join or remain in the workforce. By strengthening the support for families on various fronts, including child care services, community and home care support services for elderly, establishing breastfeeding-friendly workplace and implementing family-friendly employment practices, we aim to remove barriers that prevent women from entering or remaining in the workforce. As announced by the Chief Executive in her inaugural Policy Address last October, the Government will commence a study on the enhancement of maternity leave. Currently it is only ten weeks. Our aim is to increase it to 14 weeks. We have also secured in-principle agreement of the Labour Advisory Board to increase statutory paternity leave from three to five days. I am confident that this five-day paternity leave will come into being in July this year. Apart from these measures, we understand that child care services are fundamental to supporting parents to combine family obligations with work responsibilities. We will provide a total of about 300 additional places in aided stand-alone child care centres in North District, Kwun Tong, Kwai Tsing and Sha Tin starting from 2018-19. To review the long-term development of child care services, we have commissioned the University of Hong Kong to conduct a consultancy study and to make recommendations on the long-term service planning of child care services in Hong Kong. The study is expected to be completed this year. Meanwhile, to further alleviate the pressure on working women in looking after their children, we relaxed the income limit for low-income families under the Fee-waiving Subsidy Scheme for After School Care Programme through the Community Care Fund and provided 2,000 additional fee-waiving and fee-reduction places in early October last year. Looking ahead, we will inject $400 million into the Partnership Fund for the Disadvantaged in the next financial year. Of this amount, $200 million will be devoted to implementing after-school learning and support programmes and about 130,000 grassroots children are expected to benefit. We believe that all these efforts will be conducive to unleashing women's working potential. In fact, the labour force participation rate for women in Hong Kong has increased from about 45 per cent back in 1996 to about 51 per cent in 2016. There is certainly room for improvement, considering that about 54 per cent of the university students enrolled in undergraduate programmes funded by the University Grants Committee were females in 2016. What is more fascinating is that close to 60 per cent of the students majoring in business and management in universities were females, not to mention that 48 per cent of Hong Kong's solicitors and 50 per cent of our public accountants are females. 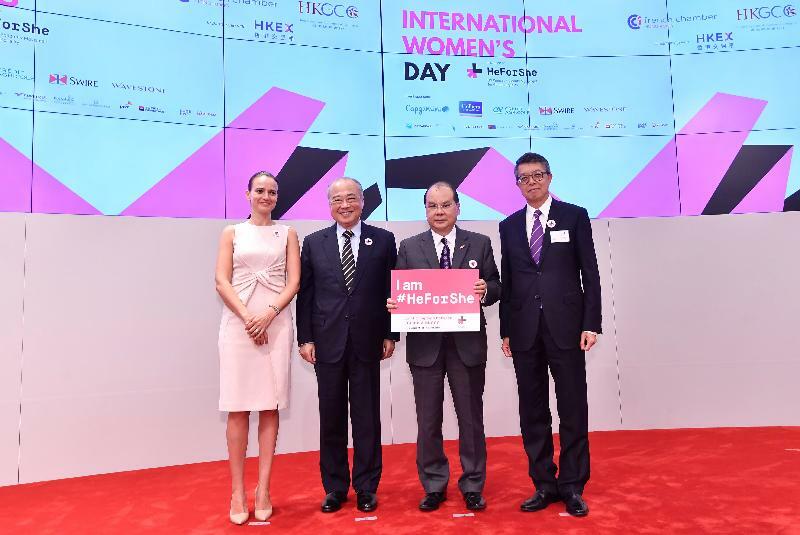 It is also encouraging that women's share of managerial positions in Hong Kong has also gone up from about 20 to 33 per cent. In the public sector, we have more than one-third of our civil servants at directorate grade level being women, compared to just over 15 per cent 20 years ago. If you look at the Police Force, even more interesting, the percentage of female officers in inspector ranks has increased from 13 per cent in 1990 to 30.2 per cent in 2017, while the percentage in superintendent ranks has increased from 2.8 per cent to 22.3 per cent for the same period. Last year, Ms Winnie Chiu Wai-yin has become the first female Deputy Commissioner of Police in Hong Kong and also the highest ranked female police officer ever since the establishment of the Police Force in 1844, showing that women are just as capable as men. We have also set a gender benchmark target of 35 per cent for appointing women to Government advisory and statutory bodies. As at last year, the overall percentage of women's participation in our advisory boards with Government-appointed non-official members stood at 31.8 per cent. We will definitely strive to achieve a more balanced mix within our advisory and statutory bodies. Notwithstanding our promising progress in various areas, I am fully aware that there is still "glass ceiling" at the top management level in our corporate boards. At present, only around 14 per cent of the board directors of Hong Kong's Hang Seng Index companies are women. Even though it compares favorably with a few East Asian counterparts, say Singapore at under 10 per cent, Japan only at 3.4 per cent and South Korea at just over 4 per cent, it is of paramount importance to realise how far we still have to go to achieve genuine equal opportunities for all women at all levels. In this regard, I call upon you for greater support as champions for change towards a more gender-balanced corporate environment in Hong Kong. I would also welcome proactive measures to be taken to enhance the percentage of women on boards among Hong Kong listed companies. Perhaps some insights on this could be drawn at the Panel meetings later on. To further raise the awareness of gender mainstreaming in the business community, we have set up the Gender Focal Point network among listed companies at the end of 2016 with the support of Hong Kong Exchanges. The Gender Focal Points, comprising representatives at director level or equivalent of the listed companies, help raise awareness and understanding of gender-related issues and promote gender sensitivity concept in the daily work of their staff. We are delighted that over 160 listed companies have joined our network. We will continue to explore ways to further leverage this valuable network to remove any barriers preventing women from unleashing their potential. In this respect, I must pay warm tribute to CK for setting a shining example for "HeForShe" as you have been rendering full support in setting up this Gender Focal Point network. The Hong Kong Exchanges has also in the past spearheaded reforms to promote board diversity. I hope that all of you will keep up the good work in furthering gender equality in the business community. On this note, I wish the HeForShe event another great success and all participants a most stimulating and fruitful exchange and a successful and prosperous Year of the Dog. Thank you very much.